Willem de Kooning in his studio. Willem de Kooning (24 April 1904 – 19 March 1997) was an abstract expressionist painter, born in Rotterdam, Netherlands. Together with Jackson Pollock he became leader of American Abstract expressionism. In the beginning he was strongly influenced by Picasso, Cubism, and w:Chaim Soutine. He was married with Elaine de Kooning and closely befriended with Arshile Gorky; later with Franz Kline. Art never seems to make me peaceful or pure. I always seem to be wrapped in the melodrama of vulgarity. I do not think.. ..of art as a situation of comfort. Quote of De Kooning from Beyond the Aesthetic, Robert Motherwell, Design 47, April 1946, as quoted in Abstract Expressionist Painting in America, W.C, Seitz, Cambridge Massachusetts, 1983, p. 101. Quote from Abstract Expressionism, David Anfam, Thames and Hudson Ltd London, 1990, p. 130. Abstract Expressionism, David Anfam, Thames and Hudson Ltd London, 1990, p. 150. When, about fifteen years ago, I walked into Arshile's studio for the first time, the atmosphere was so beautiful that I got a little dizzy and when I came to, I was bright enough to take the hint immediately. If the bookkeepers think it necessary to make sure of where things and people came from, well then, I came from 36 Union Square [address of the studio of Gorky that time].. .I am glad that it is about impossible to get away from his powerful influence. The Renaissance and Order (1950) Trans/formation, vol. 1, no.2, 1951, pp. 85-87. There is a train track in the history of art that goes way back to Mesopotamia. It skips the whole Orient, The Mayas, And American Indians. Duchamp is on it. Cézanne is on it. Picasso and the Cubists are on it; Giacometti, Piet Mondrian, and so many.. .I have some feeling about all these people – millions of them – on this enormous track, a way into history. They had a peculiar way of measuring. They seemed to measure with a length similar to their own height.. .The idea that the thing that the artist is making can come to know for itself, how high it is, how wide and how deep it is, is a historical one, - a traditional one I think. It comes from man's own image. De Kooning’s lecture Trans/formation at Studio 35, 1950.
short answer of Willem de Kooning in a panel discussion in 1950 when the former director of the New York museum of modern Art, Alfred H. Barr, Jr. demanded: We should have a name for which we can blame the artists – for once in history! I admit I know little of Orient art. But that is because I cannot find in it what I am looking for, or what I am talking about. To me the Oriental idea of beauty is that 'it isn’t there'. It is in a state of nor being there. It is absent. That is why it is so good. It is the same thing I don't like in Suprematism, Purism and non-objectivity... I do like the idea that they - the 'pots and pans' [pictured in the classic still life paintings], I mean – are always in relation to man. They have no soul of their own, like they seem to have in the Orient..
Quote from De Kooning's lecture Trans/formation, at Studio 35, 1950. The aesthetics of painting were always in a state of development parallel to the development of painting itself. They influenced each other and vice versa. But all of the sudden, in that famous turn of the century  a few people thought they could take the bull by the horns and invent an aesthetic beforehand. After immediately disagreeing with each other, they began to form all kinds of groups, each with the idea of freeing art.. .The question as they saw it, was not so much what you could paint, but what you could not paint. You could not paint a house or a tree or a mountain. It was then that the subject matter came into existence as something you ought not to have. De Kooning's speech 'What Abstract Art means to me' on the symposium 'What is Abstract At' - at the Museum of Modern Art, New York, 5 February, 1951, n.p. Quote from De Kooning's speech 'What Abstract Art means to me' on the symposium 'What is Abstract At' - at the Museum of Modern Art, New York, 5 February, 1951, n.p. Kandinsky understood 'form' as a form, like an object in the real world; and a object, he said, was a narrative – and so, of course, he disapproved of it. He wanted ‘his music without words’. He wanted to be 'simple as a child'. He intended, with his 'inner-self' to rid himself of 'philosophical barricades' (he sat down and wrote something about all this). But in turn his own writing has become a philosophical barricade, even it is a barricade full of holes. It offers a kind of Middle European idea of Buddhism or, anyhow, something too theosophical for me. The sentiment of the Futurists was simpler. No space. Everything ought to keep going! That's probably the reason they went themselves. Either a man was a machine or else a sacrifice to make machines with.. I still think that Boccioni was a great artist and a passionate man. I like El Lissitsky's painting very much. But Mondrian that great merciless artist, is the only one who had nothing left over. The point they all had in common was to be both inside and outside at the same time. A new of likeness!. ..for me to be inside and outside is to be in an unheated studio with broken windows in the winter. Personally, I do not need a movement. What was given to me, I take for granted. Of all movements, I like Cubism most. It had that wonderful unsure atmosphere of reflection - a poetic frame where something could be possible, where an artist could practise [sic] his intuition. It didn't want to get rid of what went before. Instead it added something to it. The parts that I can appreciate in other [art] movements came out of Cubism. Cubism became a movement, it didn't set out to be one. It has force in it, but it was no 'force-movement.' And then there is that one-man movement, Marcel Duchamp - for me a truly modern movement because it implies that each artist can do what he thinks he ought to - a movement for each person and open for everybody. Some painters [of the New York School], including myself, do not care what chair they are sitting on. It does not even have to be a comfortable one. They are too nervous to find out where they ought to sit. They do not want to 'sit in style'. Rather, they have found that painting - any kind of painting, any style of painting - to be painting at all, in fact - is a way of living today, a style of living, so to speak. That is where they form of it lies. It is exactly in its uselessness that it is free. Those artists do not want to conform. They only want to be inspired. Quote of de Kooning, in: Modern Artists in America, First Series, R. Motherwell, Ad Reinhardt and B. Karpel eds., 1952 p. 12. [in Italian Renaissance] there was no 'subject-matter'. What we call subject matter now, was then painting itself. Subject matter came later on when parts of those works were taken out arbitrarily, when a man for no reason is sitting, standing or lying down. He became a bather, she became a bather; she was reclining; he just stood there looking ahead. That is when the posing in painting began.. .For really, when you think of all the life and death problems in the art of Renaissance, who cares if a Chevalier is laughing or that a young girl has a red blouse on. The Renaissance and Order Trans/formation 1, 1951; as quoted in Abstract Expressionist Painting in America, W.C, Seitz, Cambridge Massachusetts, 1983, p. 113. The potato seems like a Romantic (organic) object.. ..you can watch it growing if you don’t eat it. It is going to change – grow, rot, disappear. A pebble is like a Classical thing – it changes little if any.. .If it was big you could keep the dead down with it.. ..The Classical idea is not around much anymore. [Der Koning is comparing the Potatoes of Vincent Van Gogh to the Pebbles of Jean Arp. You know the real world, this so-called real world, is just something you put up with. Like everybody else. I'm in my element when I am a little bit out of this world. Then I'm in the real world – I'm on the beam. Because when I'm falling, I'm doing all right. When I'm slipping, I say: he, this is interesting. It's when I'm standing upright that bothers me. Quote from film script Sketchbook 1, Time inc; 1960. I met him [Arshile Gorky] in 1929. Of course I met a lot of artists, but then I met Gorky. Well I had some training in Holland, quite a training, you know, The Academy. And then I met Gorky [in New York], who didn't have that at all, he became from no place [Tiflis, Armenia].. .And for some mysterious reason, he knew lots more about painting, and art, he just knew it by nature - things I was supposed to know and feel and understand - he really did it better. He had an extraordinary gift for hitting the nail on the head, very remarkable, so I immediately attached myself to him and we became very good friends. Certain artists and critics attacked me for painting the 'Women' [series of paintings, De kooning started in 1950], but I felt that this was their problem, not mine. I don’t really feel like a non-objective painter at all.. .It's really absurd to make an image, like a human image. With paint, today, when you think about it, since we have this problem of doing it or not doing it. But then all of a sudden it was even more absurd not to do it. So I fear I have to follow my desires. The 'Women' [paintings] had to do with the female painted through all ages, all those idols, and maybe I was stuck to a certain extent; I couldn't go on. It did one thing for me: it eliminated composition, arrangement, relationships, light – all this silly talk about line, colour and form – because that was the thing I wanted to get hold of. No, the artists are in a state of belated Age of Reason. They want to get hold of things, like Mondrian. He was a fantastic artist, but now when we read his ideas and his idea of Neo-Plasticism [= De Stijl ] – pure plasticity – it’s kind of silly, I think. I mean, not for him, but I think one could spend one's life having this desire to be in and outside at the same time. He could see a future life and a future city – not like me, who am absolutely not interested in seeing the future city. I'm perfectly happy to be alive now. But I find, because of modern painting, that things which couldn't be seen in terms of painting, things you couldn't paint.. ..it is not that you paint them, bit is the connection. I imagine that Cézanne, when he painted a ginger pot with apples, must have been very grotesque in his day, because a still life was something set up of beautiful things. It may be very difficult, for instance, to put a Rheingold bottled beer on the table and a couple of glasses and a package of Lucky Strike [cigarets]. I mean, you know, there are certain things you cannot paintat a particular time, and it takes a certain attitude how to see those things, in terms of art. The pictures [De Kooning had] done since the 'Women', they're emotions, most of them. Most of them are landscapes and highways and sensations of that, outside the city – with the feeling of going to the city or coming from it. I am not a pastoral character. I'm not a – how do you say that? – 'country dumpling'. I am here and I like New York City. But I love to go out in a car.. .I'm just crazy about going over the roads and highways. Interview conducted by David Sylvester for the BBC, 1962; as quoted in Abstract Expressionism: Creators and Critics, edited by Clifford Ross, Abrahams Publishers, New York 1990, p. 48. Well, now I can make some highways, maybe. Well, now I can set out to do it and maybe it will be a painting of something else. Because if you know the measure of something, for yourself.. .There's is no absolute measure that you can identify yourself. You can find the size of something . You say, now ,that's just this length, and immediately with that length you can paint, well, a cat maybe. If you understand one thing, you can use it for something else. Well, that is the way I work.. .I get hold of a certain thing of area or measure or size and then I can use it. I mean, I have an attitude. I have to have an attitude. I feel now if I think of it, it will come out in the painting. In other words, if I want to make the whole painting look like a bottle, like a lot of bottles - for instance maybe the end of the day, when everything is very light, but not in sunlight necessarily - and so if I have this image of this bottle and if I really think about it, it will come out in the painting. That doesn’t mean that people notice a bottle, but I know when I succeed in it – then the painting would have this. I make a little mystique for myself. Since I have no preference or so-called sense of color, I could take almost everything that could be some accident of a previous painting. Or I set out to make a series. I take, for instance, some pictures where I take a color, some arbitrary color I took from some place. Well, this is gray maybe, and I mix the color for that, and then I find out that when I am through with getting the color the way I want it, I have six other colors in it, to get that color; and then I take those six colors and I use them also with this color. It is probably like a composer does a variation on a certain theme. But it isn't technical, it isn't just fun. I feel sometimes an American artist must feel, like a baseball player or something - a member of a team writing American history..
..the word 'abstract' comes from the light tower of the philosophers.. ..one of their spotlights that they have particularly focused on 'Art'.. ..(abstraction was) not so much what you could paint but rather what you could not paint. You could not paint a house or a tree or a mountain. It was then that subject matter came into existence as something you ought not have. Quote from Abstract Expressionist Painting in America, W.C, Seitz, Cambridge Massachusetts, 1983, p. 121. The point they (Lissitzky, Rodchenko, Tatlin, Gabo, the neo-Plasticists, and so on) all had in common was to be inside and outside at the same time.. .For me, to be inside and outside is to be in an unheated studio with broken windows in the winter, or taking a nap on somebody's porch in the summer. Willem de Kooning, MOMA Bull, pp. 7,6, as quoted in Abstract Expressionist Painting in America, W.C, Seitz, Cambridge Massachusetts, 1983, p. 134. Man's own form in space – his body – was a private prison; and that it was because of this imprisoning misery – because he was hungry and overworked and went to a horrid place called home late at night in the rain, and his bones ached and his head was heavy. Willem de Kooning, MOMA Bull, pp. 7,6; as quoted in Abstract Expressionist Painting in America, W.C, Seitz, Cambridge Massachusetts, 1983, p. 135. There is a time when you just take a walk.. ..you walk in your own landscape.. .It has an innocence that is kind of a grand feeling.. .Somehow I have the feeling that old man Monet might have felt like that, just simple in front of things, or old man Cézanne too.. .I really understand them now. And then there is that one-man movement, Marcel Duchamp — for me a truly modern movement because it implies that each artist can do what he thinks he ought to — a movement for each person and open for everybody. Quoted in A Brief History of American Culture (1996) by Robert M. Crunden, p. 279. I think I would choose Soutine.. .I've always been crazy about Soutine - all of his paintings. Maybe it's the lushness of the paint. He builds up a surface that looks like a material, like a substance. There's a kind of transfiguration, a certain fleshiness in his work.. .I remember when I first saw the Soutine's in the Barnes Collection.. ..the Matisse's had a light of their own, but the Soutine's had a glow that came from within the paintings - it was another kind of light. The impact of Chaim Soutine (1893-1943): de Kooning, Pollock, Dubuffet, Bacon, publisher: Hatje Cantz, Galerie Gmurzynska, Cologne (Köln), 2001. Answer on the question who is his favourite artist, probably made around 1977. I had my own eyes, but I wasn't always looking in the right direction. I was certainly in need of a helping hand at times. Now I feel like Manet who said, "Yes, I am influenced by everybody. But every time I put my hands in my pockets I find someone else's fingers there." As quoted in Willem De Kooning, 1904-1997: Content as a Glimpse by Barbara Hess, 2004. The artist's tool or the traditional artist's brush and maybe even oil paint are all disappearing very quickly. We use mostly commercial paint, and we generally tend toward lager brushes. 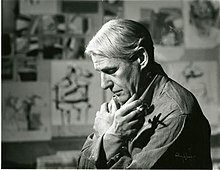 In a way, Abstract expressionism started this all: De Kooning used house painter's brushes and house painters' techniques. ..I'm sure that Pollock's ambiance affected me tremendously. I was much more drawn to Pollock's painting on the raw canvas [and on the floor!] than I was to de Kooning's easel cuisine and there it's a matter of sensibility. Aesthetically, socially, in every way the de Kooning thing seemed to be much more productive, planned, admirable at the time. But I didn't think so. I thought that Pollock was really the one living in nature much more than Bill [= Willem de Kooning]. I think Rothko really made a break with his past - I've made this point before - and Franz Kline also made a break with his past. They just changed completely in a way that Gorky and Willem de Kooning never did. Their work was always a continuity and one grew out of the other. Let's say, paintings that de Kooning was doing in the '70's had very little to do with the things that he was doing in the '40's, ostensibly, but it was a smooth continuous flow. It was not like saying, "I repudiate that." Let us watch this de Kooning [Dali comment here the 'Woman' paintings, Willem de Kooning painted in the early 1950's] with his prematurely white hair making his great sleepwalker's movements, as though he was waiting in a dream to open bays of Biscay, to explode islands like pieces of orange or Parma violets, to tear continents from a cerulean blue split by oceans of Naples yellow.. ..if by good or by ill fortune, in the middle of this Dionysian demiurg the image of 'The Eternal Feminine' should appear.. ..the least that might have happened to her would be that she should emerge (from all this chaos) wearing nothing but a little make-up. So it is appropriate that de Kooning's pictures of the 1960's are drained of the anguish and look of despair which so profoundly marked his earlier work. In the new In the new women ['Women' paintings], the mood is Joy. In the days before de Kooning establishing himself formally as a painter, Willem de Kooning had a variety of experiences that helped him to define himself. His influences by friends and the times were surprising. Of the singular influences was his relationship to music. In the early thirties,. ..de Kooning made one astonishing and symbolic purchase. Just when the Depression was destroying the livelihood of millions of people, including that of many artists, de Kooning bought the best and most expensive record player money could buy - a miraculous machine that could summon "God and all those angels up there." Called a Capehart high-fidelity system, it was one of the first to change records automatically. It cost then the prodigious sum of $700, more than half of de Kooning's annual salary at A.S. Beck; he got an advance to pay for it. With this purchase, de Kooning announced that he would not use this money to make himself conventionally respectable, even during the hard, early years of the Depression. He did not buy a house or a car, get married, have a baby, or stash away money against hard times. Instead, he professed himself sublimely irresponsible, a man nourished by music rather than mundane realities. And yet, it was still music rather than art that prompted his expansive gesture, for he could not yet find a comparable fluency, vitality, or extravagance in art."